When we discovered that we needed to move out of our Witchy Cottage rental house, my husband and I were devastated. We'd made so many fond memories there since our last house cleansing ritual and were just settled in. But, as luck would have it, we ran across a rentable Queen Anne style home in a historic section of our city! We're looking forward to calling this adorable 105-year-old house home but, before we could do that, it needed to be cleansed. The symbolism for keys is overwhelming and perfect for any house cleansing. Keys open new doors and opportunities, but they also close and lock doors to protect us from harm. They both welcome and refuse, protect and bless. And that's perfect for how I manage my house cleansing rituals. 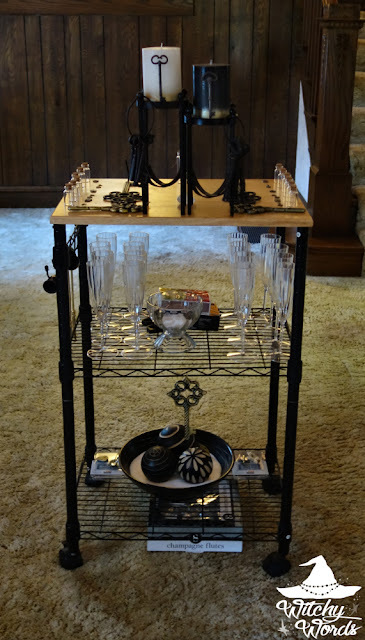 I used the central altar from my circle room for our house cleansing ritual because it has two shelves underneath to accommodate our items, as well as hooks on the side for candle snuffers. A binder with the ritual inside. Fire safety item of choice in case of accidents. A compass if you need to determine where the corners are. Candle snuffers for each corner. A black candle for protection. A white candle for blessing. Something made of iron to protect the front door. Items needed to create protective ashes. Items needed to create blessing keys. Our blessing bowl filled with salt and ready to use, as well as our items for that bowl. A yellow candle in a candle holder. A red candle in a candle holder. A lantern with a black candle. A blue candle in a candle holder. A bowl of purified water. A green candle in a candle holder. A piece of quartz for each altar. Quarter call and closing for each direction. I realize that, at this point, the item list seems overwhelming. I assure you that all of this fit into one medium-sized box. Well, sans broom of course. That one medium sized box was the simplest thing I carried in the entire move. All of the tools were cleansed the day before and brought into the house the morning of the ritual. Last year, I waited until everyone was at the house and then proceeded to cleanse everyone so that we could all enter at once. That took entirely too long. This year, I came cleansed via a salt and lavender bath so that I could enter and set up long beforehand. This allowed me to bring my broom in first, sweep everything out, hang my rune chain, place quartz, pennies and salt, and so forth long before the ritual started. Fellow CF member and roommate Tony stood on the front porch and used smoke from a sage bundle to cleanse each person before they came into the house. This worked much better! 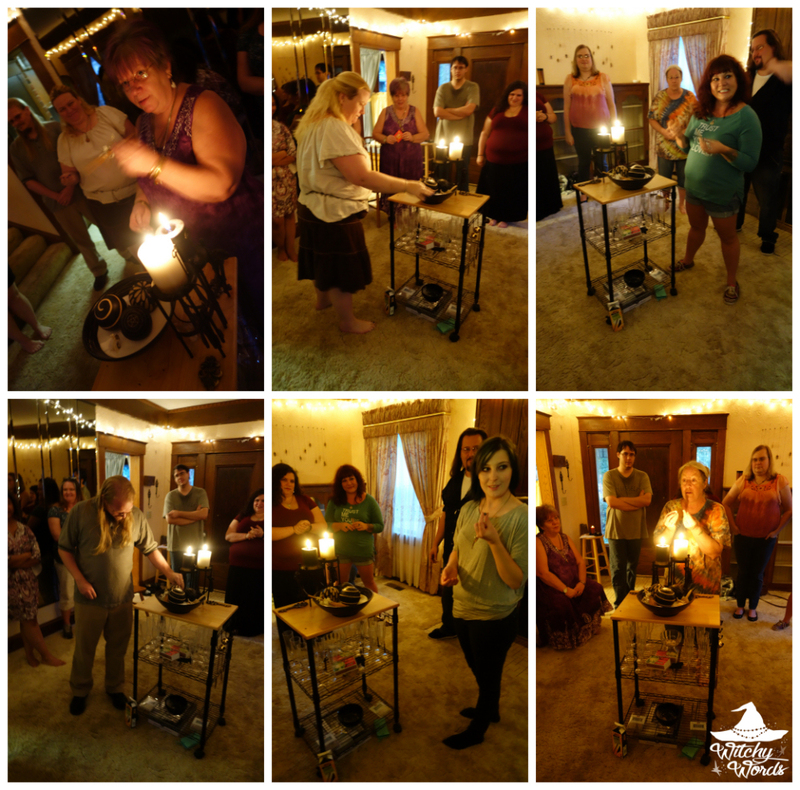 To begin to call the quarters, each volunteer took an item that represented their direction and cleansed the house with it. Tony, who called Air, used a sage bundle to cleanse the house with smoke. Kira, who called Fire, used a lantern with a black candle lit to illuminate all the corners. Kolika, who called Water, sprinkled purified water. Finally, Phaedra, who called Earth, threw a light amount of salt. Instead of having one direction go at a time, we instead walked together in a clockwise motion throughout the house. This too saved time from last year's ritual. Now that the house was cleaned, I wanted to protect against any negativity returning. To do this, Tony and I nailed something made of iron near the door. Iron is said to have protective properties and, lucky me, I ran across these beautiful iron antique-key-shaped key holders that are just perfect for this portion! We also placed quartz in the door and spread salt across it. The house is cleansed! 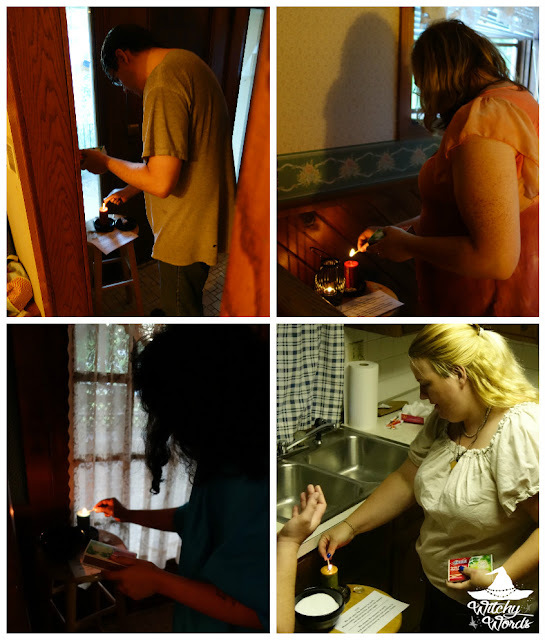 Once each element had been used to cleanse the house, we officially began ritual by calling the quarters starting with Tony at East/Air. The calls for the quarters were exactly the same as last year's calls. As a group, we would move in a clockwise motion and raise our arms to welcome each direction to our circle. We were now officially ready to begin ritual! The first step of ritual was to protect the house. To do this, my ritual mates and I worked together to create protective ashes. For more information on that spell, including several pictures and a full description, click here! To summarize this part of the ritual, each member took a small piece of paper and wrote/drew something protective on it. 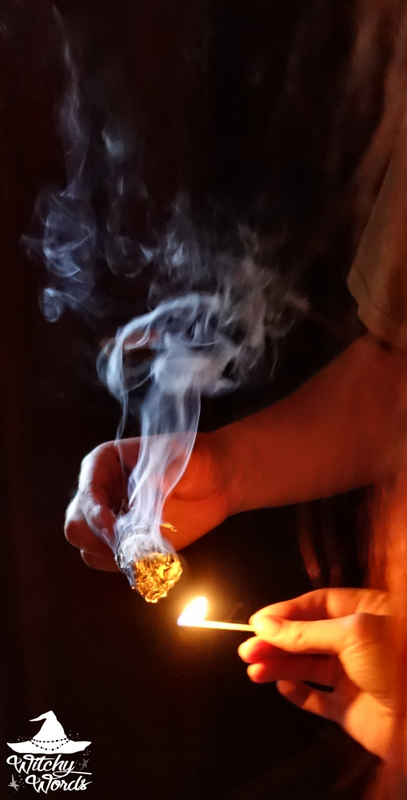 They then burned the paper in the black candle's flame and left it in the fire-proof bowl to finish burning. Once the fire went out, I scooped a bit of it into a vial and left it on the mantel. 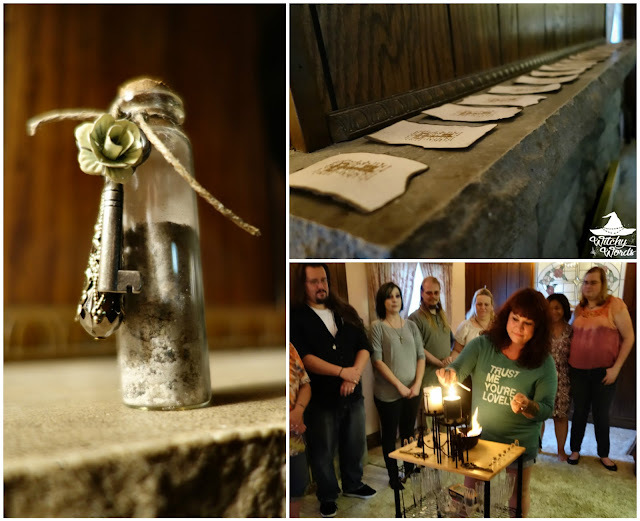 I also offered small vials for each person who attended so that they took could bring protective ashes to their home as well! 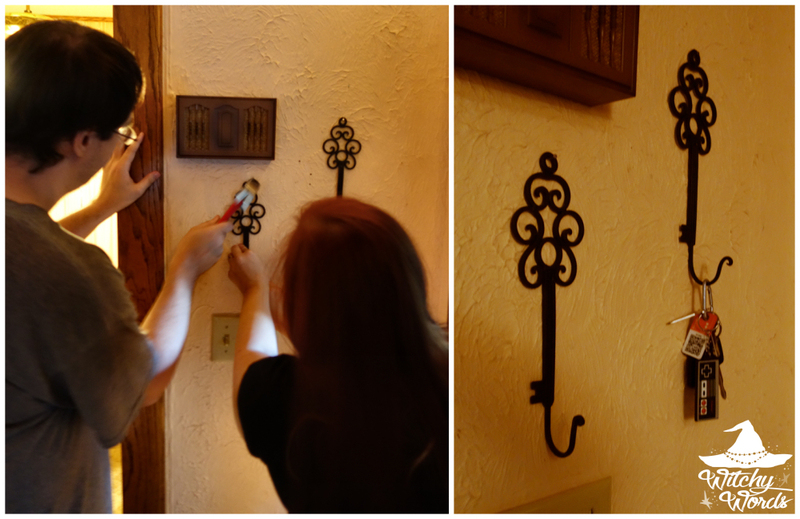 The second step of ritual represented the symbolism of the keys by both protecting and blessing the house. To do this, my ritual mates hung blessing keys. 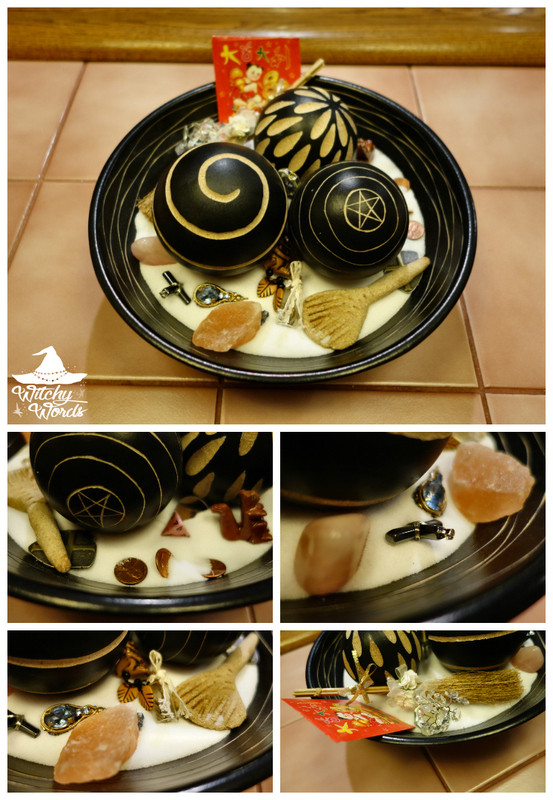 For more information on that spell, including several pictures and a full description, click here! 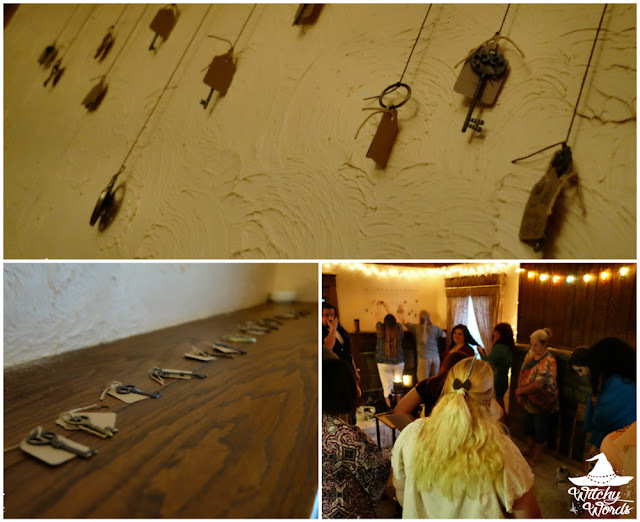 To summarize, each person who attended this ritual wrote or drew something that both protected and blessed our home on a tag, then charged the key charm attached to the tag with a special purpose. They each then hung the keys! 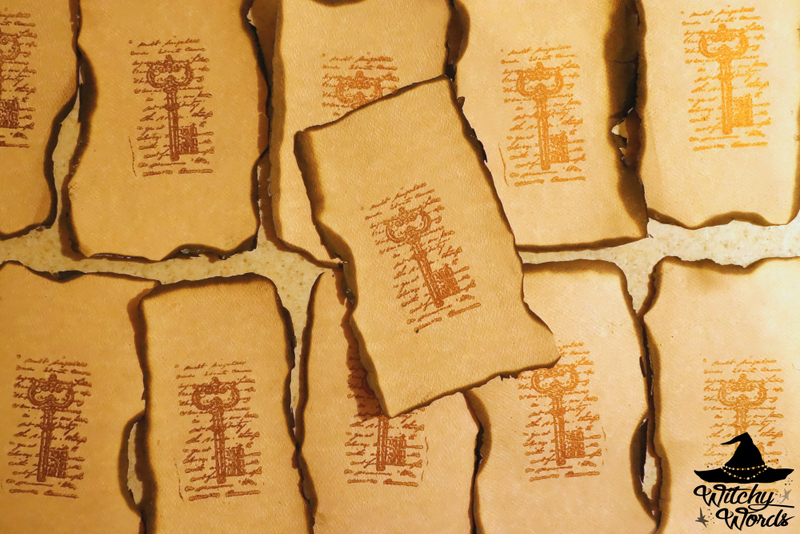 Each person also got to take home a small key charm charged with positive energy for their home. 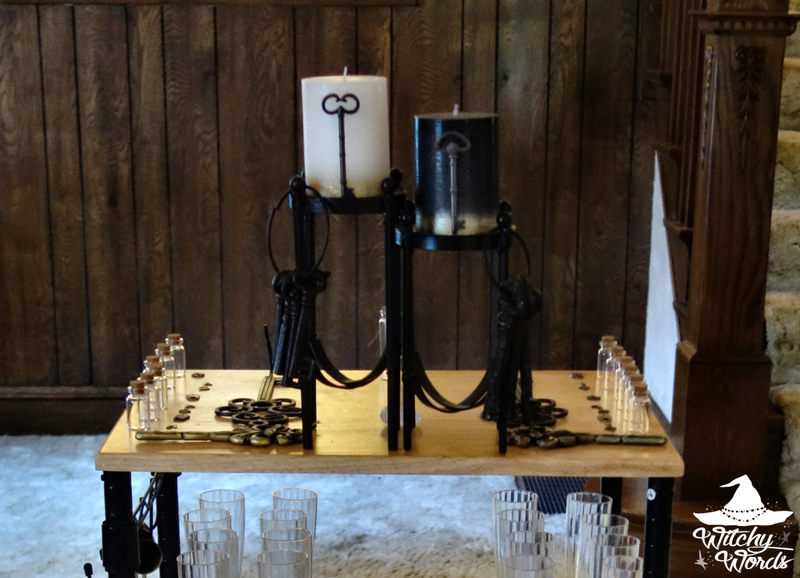 This piece of the ritual was used last year as well! For more information on the blessing bowl, including several pictures and a full description, click here! This year, I started the bowl off with a decorative key that represented the house. 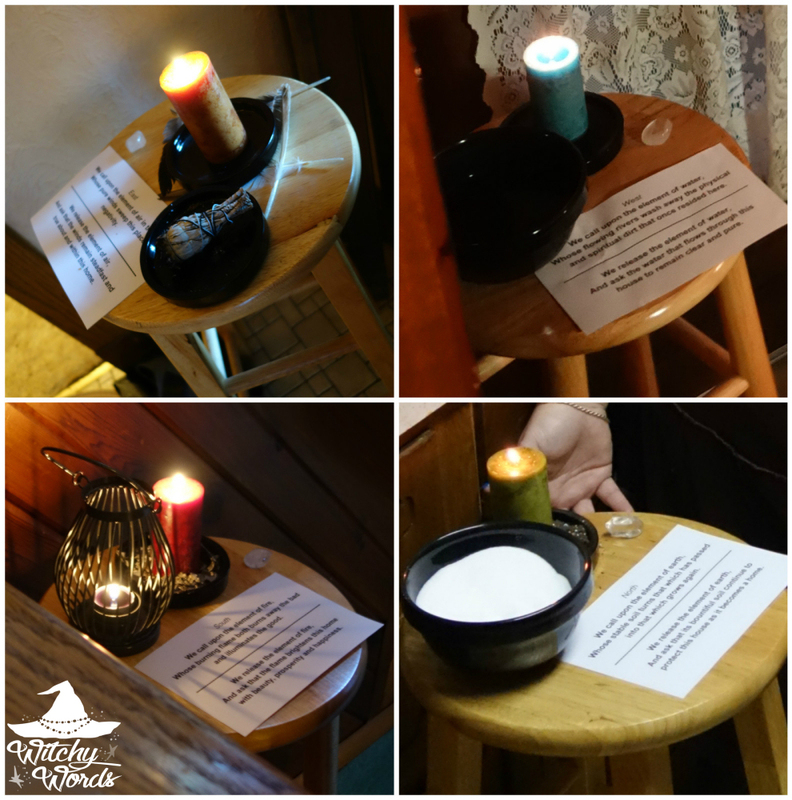 I then had everyone bring something special for the bowl to bless our house with a specific meaning. So many amazing items were brought! In addition, all three of us living at the house brought something to add as well, which varies from last year's ritual. Take a look at the finished piece for this house! In this portion of the ritual, we served wine, in the form of non-alcoholic carbonated grape juice since everyone was driving home shortly afterward, and a special prosperity bread made by fellow CF guest member Emily! You can find the recipe here! We each gave a toast to the house and blessed each other that we may never thirst. We also split the bread and blessed each other that we may never hunger. 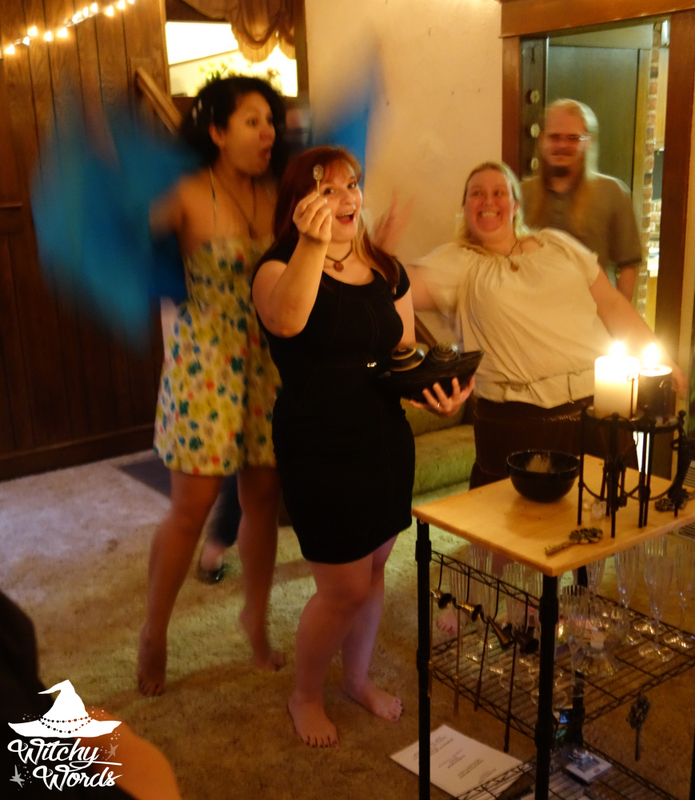 During the ritual, I clarified that any good, well-meaning house spirits could stay. This was particularly important to me with the house being 105-years-old. 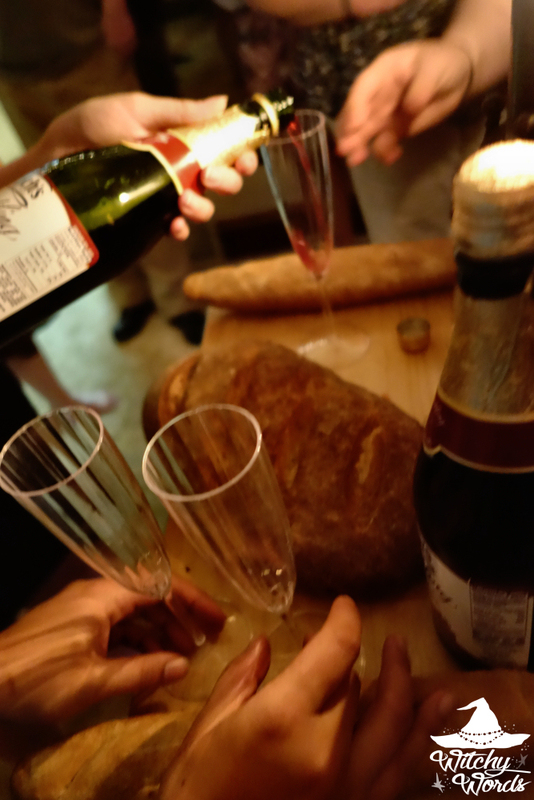 To make an offering to them, a glass of the faux wine and prosperity bread was left on the stove. "Merry meet and merry part and merry meet again!" 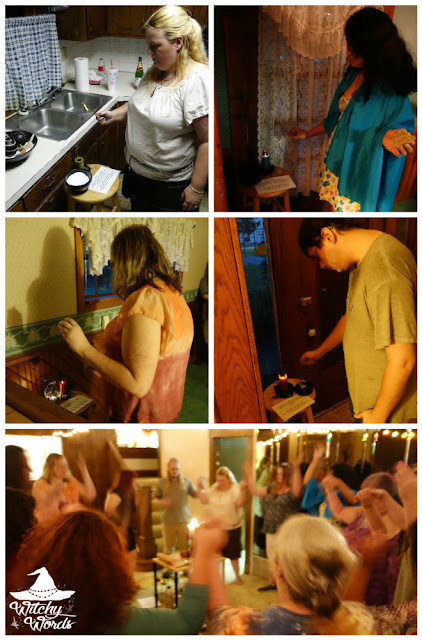 My husband's birthday was August 18th - just one day before the house cleansing ritual. 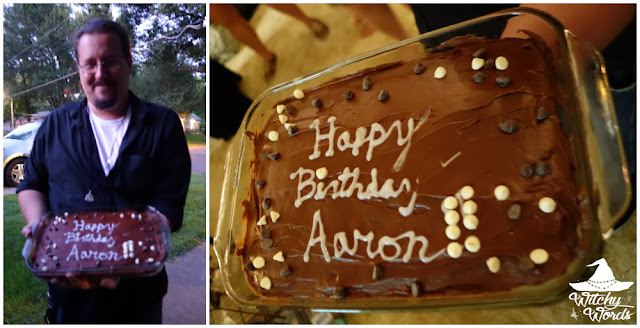 I had planned on throwing Aaron a huge surprise birthday party this year. He's been through so much with a tumor removal and I wanted to give him something big, but then the move popped up on us suddenly and my plans were destroyed. In hops all of my amazing friends! Jason, pictured above, volunteered to bake Aaron a special chocolate cake with chocolate frosting and chocolate chips (all of my husband's favorites, by the way). Those who attended brought pop and cups and everything we needed, keeping them in their car until it was time. Once the ritual was over, Jason slipped out to his car, got the cake and we all entered back into the sitting room where the main part of ritual was held. My husband was still on the stairway, oblivious! I got everyone's attention, Jason uncovered the cake and we gave Aaron a surprise birthday celebration! This guy, my fellow readers, puts up with so much from me. Despite not liking photography at all, he's picked up the camera to photograph all the rituals I can't, including all of Circle of Fountains' rituals. He deals with me pointing to things quietly and giving him "the stare" so he can grab photos of specific portions and even having me grab the camera so I can take pictures myself. Between the two of us, we get everything covered, but I absolutely could not do it without him. To make everything worse, he had a terrible sinus infection the night of the house cleansing ritual, so he didn't feel very good at all! But here he is, taking pictures and being an awesome husband. So a surprise party was the least I could do. 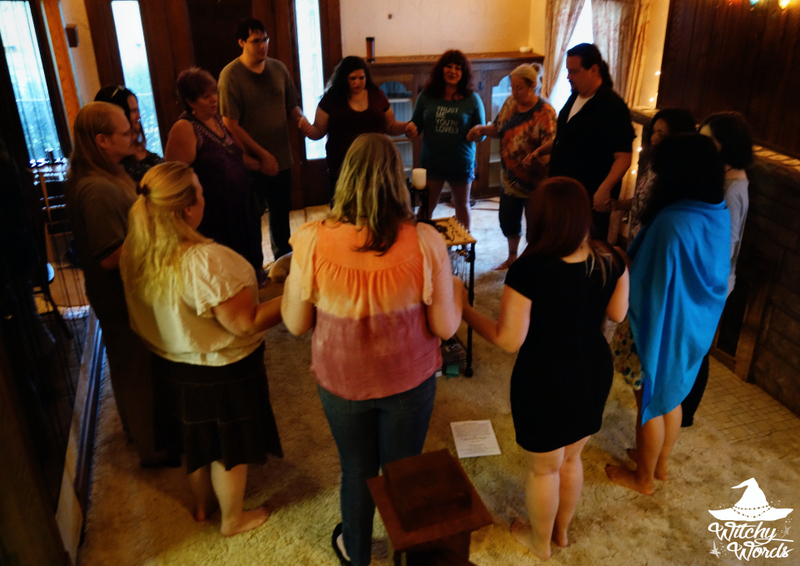 We started the cleansing ritual at 7:15 pm and ended before 9 (the sun hadn't completely set yet!). The party ended up lasting until sometime after 11 pm on a Wednesday night. Thank you so much to everyone who made it possible! 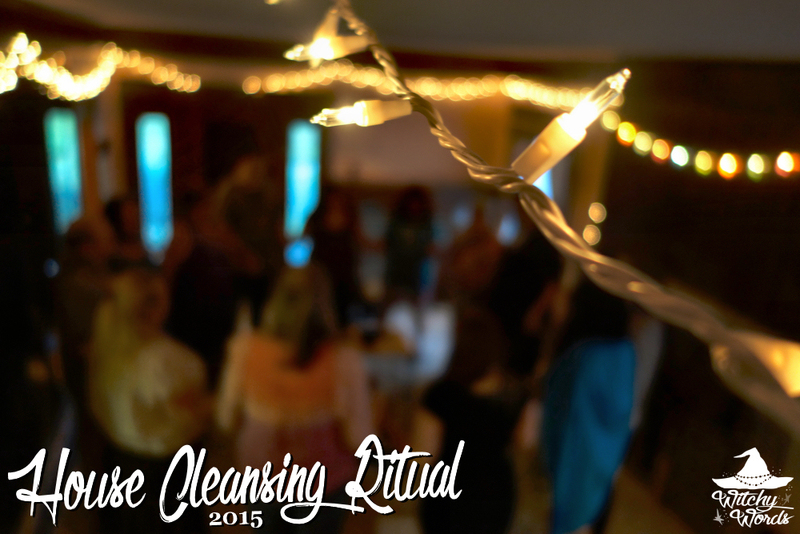 And that concludes the final installation of my 2015 House Cleansing Ritual series! Enjoy your new home. We're definitely enjoying ours! I read this post and the post you wrote regarding the last time you did a house blessing and the two are as different as night and day! I think this space will work better for you - it seems more organic than the last house and you seem so much happier and AT HOME here. Blessings to you and yours! Congratulations on the new beautiful home! 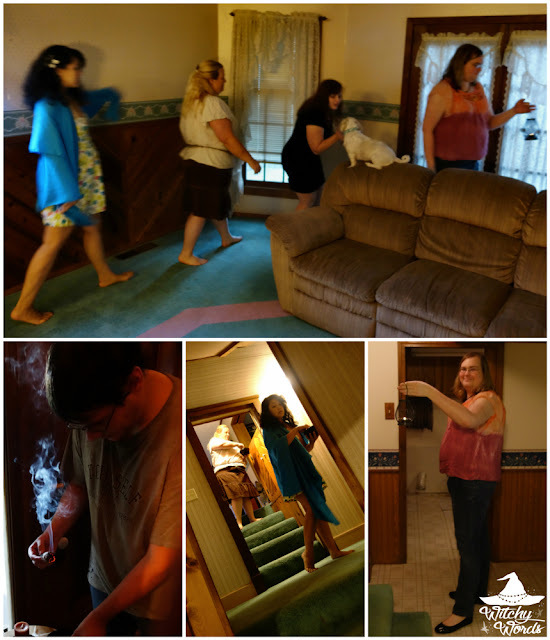 I've recently moved back into what used to be my family's home when I was a teenager, and have done some cleansing rituals alone. Recently, I've experienced some funky energy here though, and I think it might be a great idea to bring loved ones in for something more like you've done. Thanks for the inspiration! I wish you the most awesome and wonderful experiences in your new home. I LOVE your blog, and was so excited to see the Sabbat Box stuff. I immediately went to the site and added my name to the list. Have a most wonderful day.